Most of us cold-weather oenophiles have spent this brutal, seemingly never-ending winter fortifying ourselves against the freeze with rich, full-bodied red wines. Personally, I consumed a record number of North Coast California Syrahs and Loire Valley Cabernet Francs. Not to mention all the accompanying pork and beef that provided an extra layer of insulation that will take some extra trips on my bike to work off. But now, spring is upon us! It's the glorious season of hanging out on fire escapes and in backyards, because before we know it, the summer heat will be pushing us back inside—this time into air-conditioned rooms. All of which means swapping out the heavy reds that had been keeping us warm for light, crisp whites, like my favorite springtime wine, Sauvignon Blanc. Unfortunately, my fellow Americans haven't always been as big a fan of the varietal as me. The Sauvignon Blanc grape originated in the Bordeaux region of France, but gained initial fame in the18th century from wines bottled around 200 miles to the north in the Loire Valley. The varietal came to the United States in the 1880s and enjoyed some success until postwar Americans shied away from it; they associated Sauvignon Blanc with the sweet wines they were rejecting across the board. That spurred Robert Mondavi to do a little rebranding in the mid-1960s. He created a wine inspired by the dry, light, crisp profile of those from the Loire Valley's Sancerre and Pouilly-Fumé districts. Then he borrowed one other thing from the "Old World" to reintroduce the varietal to Americans—its naming convention (i.e., Mondavi called his version of the wine Fumé Blanc, instead of Sauvignon Blanc). You see, the U.S. follows the "new world" wine model, where the grape is always the star, as opposed to the growing region. For example, a Merlot from California simply says Merlot on the label, but in France, Merlot is primarily found in the village of St. Émilion in the Bordeaux region, so the bottle bears that name. Mondavi's subterfuge made Sauvignon Blanc popular again among Yanks. By the late 1990s, as vintners planted more Sauvignon Blanc in America—as well as other new world wine regions like Chile and New Zealand—the wine's popularity really began to surge. Ever since, Sauvignon Blanc has been a staple of afternoon wine drinkers looking for ice-cold thirst quenchers. Yet, it doesn't have to be consumed by itself. The right one can pair with any course. For appetizers, French Sauvignon Blancs work great with shellfish, especially oysters. In Sancerre the vines are planted on Kimmeridgian soil, a name taken from the village of Kimmeridgain on the Dorset coast of England, where the soil type was first categorized. A closer look at this mineral-rich dirt reveals a heavy presence of fossilized seashells, which gives the wines a harmonious connection to freshly shucked oysters. Two great French Savignon Blancs to pair with your half dozen bivalves are Franck & Jean Francois Bailly Sancerre or Clos Roche Blanche Touraine "Sauvignon." Main courses are where the new world Sauvignon Blancs come in. The sun there often shines brighter and hotter than Europe so the wines wear a more floral and fruit-driven profile—think elderflowers and peaches. They also have more body, which makes them ideal next to grilled fish. 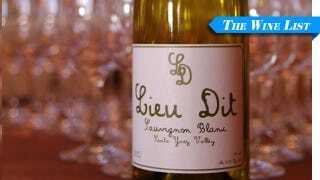 When shopping for American varietals look to wines from the Russian River Valley in Sonoma, like Thomas George, or to Southern California's Santa Ynez Valley, where Lieu Dits makes an excellent wine. Sauvignon Blanc also holds its own at the end of a meal. The most classic pairing for the wine is with goat cheese. That's no easy task given the cheese's assertive, gamey flavors. Again, the relationship can be traced back to the Loire Valley, a region well-known for these handcrafted cheeses, like the creamy, cave-aged Valencay. The goats grazing in the region are subject to the same geography, soil and climate—terrior as the French call it—as the vines growing there, which creates a harmonious flavor pairing between the wine and the cheese the goats produce. That really gets to the heart of why I'm such a fan of Sauvignon Blanc. It's amazing to see that from one small region in France where the goats graze, this grape has spread throughout the world to become such an important varietal. It has used different climates and growing styles to achieve varying flavor profiles that allow you to drink it from the afternoon through the evening. And as interest in the wine continues to grow, so will the regions that plant it, and more importantly the quality of the wines, only furthering Sauvignon Blanc's reign as the "King of Spring"! Patrick Cappiello is the Managing Partner and Wine Director Pearl & Ash Restaurant in New York City, and the creator of the Renegade Wine Dinner. He is Food & Wine magazine's 2014 Sommelier of the Year and Imbibe magazine's 2014 Wine Person of the Year. Follow him on Twitter @patrickwine.